I've been waiting for their 10Q to come out. 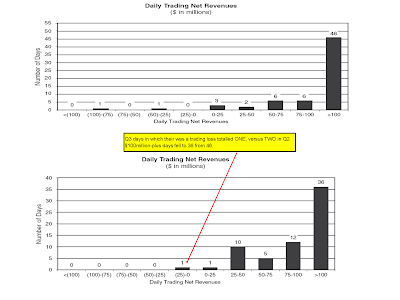 The charts on pages 124 of these reports highlight trading revenue by day. Due to summer vacations, Goldman made over $100million (in its trading account)per day only 55% of the time, down from 70% in the second quarter. Lest you worry about them though, they made money 98% of the time versus 97% last quarter. I've previously written about Goldman's shift from an investment bank to a hedge fund, but hey at least they're a VERY VERY profitable hedge fund. That said, with a 98% hit-rate while client orders are also flying about, the argument for front-running makes a lot of sense.